Combine extra virgin olive oil and garlic and season with sea salt and black pepper. Generously rub steak with half the marinade. Put in a large ziplock bag and refrigerate for up to two days. Pre heat outdoor grill to high heat. 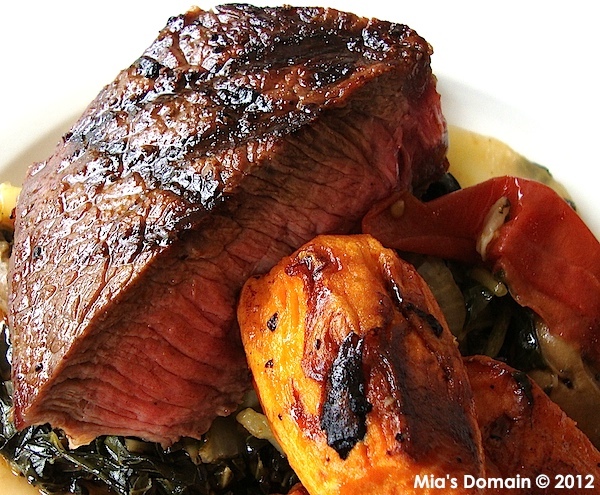 Remove steak from refrigerator and bring to room temperature (about 30 minutes). Season with sea salt and black pepper. Grill steak for 8 minutes per side for medium rare (alter time for more or less rare). Transfer to a warm plate and drizzle with extra virgin olive oil and garlic marinade. Let the steak rest for 10 minutes before you cut the steak into desired portions. lovely! Nothing beats grilled steak! YUM! I have two tenderloin steaks in the 'fridge! I'm gonna do it!! Beautiful pics! this is not fair! My bbq is covered in snow. What am I supposed to do Mia?? You have given me a craving for steak and I am stuck here without the chance to feed the craving.